They say that good readers make good writers, and while I always loved to read, writing was nothing more than a hobby. It was like dancing and painting — impractical activities that I loved to do but was assured I could never make a living out of. In high school I’d taken a creative writing class where I dabbled in poetry and wrote short stories that no one but my teacher ever read. I couldn’t bear to share them with my mother for fear of criticism. It was something I loved too deeply. It was my soul pouring out onto the page, too close to my heart to share with those who knew me. So, in the vein of practicality, I chose to major in advertising, figuring I could become a pharmaceutical sales rep or land some other money-making position. I took creative writing classes as electives until they made me declare it as a minor. But that’s all it was — a minor part of my life. Then I walked into Ruth Moose’s young adult fiction writing class. It started out like any other writing course: The small class became unusually close, we read several YA novels to become familiar with the genre (most of which I’d already read) and we did mini-writing assignments. About half way through the semester, Ruth told the class about a scholarship opportunity that she thought we should all apply for. The Phillips Travel Grant gifted many Chapel Hill students each year with up to $7,000 for traveling anywhere in the world. The process of applying and interviewing was a lot of work, but Ruth felt we all deserved the opportunity to see the world outside our backyards. Travel was something I’d always wanted to do but, ever practical, thought would be a waste of money. This seemed to be my answer. Right away I started dreaming up my proposal, but it was hard to concrete any singular idea in my mind. Finally, I talked to Ruth. And suddenly, the idea of dancing through Europe didn’t sound so ridiculous. This grant was not just for people who wanted to save the world; it was also for people who needed an experience that would broaden the mind. It was then that I felt a change in my thinking. For the first time I found myself dreaming about something that had no practical purpose: traveling through Europe learning about various cultures through dance. On top of that, if I was awarded the scholarship, I would go alone. The cautious, careful girl I had always been would be traveling via train, sleeping in hostels and traipsing around nine different countries with languages I did not speak. The idea scared me, but most of all it exhilarated me. As I waited to hear the verdict, Ruth’s class rendered another change in my thinking. It was the first class where the final project consisted of writing several chapters of a novel, not just short stories. The prospect was daunting. I did not have confidence that I could write anything as long as a novel, nor did I have a vision for my story. As a child, my imagination produced lengthy yarns that I told in a most convincing manner. As an adult, I was better at memoir writing — something where I didn’t have to worry about being imaginative. And as I wrote, I thought of more than just those few paragraphs. I thought of where my story would go, of my characters, of an ending. I discarded the novel I’d already started and turned this practice exercise into the beginning of a new novel. Everyday I found myself working on my book. It became a swirl of fact and fiction that had all my roommates begging to hear the next chapter. And when our first three chapters were due for class, I had seven. And somewhere in there, I realized that I could do this. I could be a writer. It has been a few years since then, but I pinpoint that class in my junior year of college as the catalyst for who I am today. I received the scholarship and traveled across Europe alone for six months. I kept a detailed blog the whole time, knowing that one day I could use experiences for future novels. Coming home, it was shocking to see how much I had changed. How my outlook on life was different. Instead of going into corporate America, I kept working on my writing and taught dance classes to get by. Though I am still trying to get my novel published, I was able to land a job I loved at The Charlotte Observer as a reporter — something I never would have even applied for if it weren’t for Ruth. The value of a Carolina education is measured by teachers like her. Teachers who not only teach, but inspire and encourage. She saw who I was before I did, and that is a gift I can never pay back. 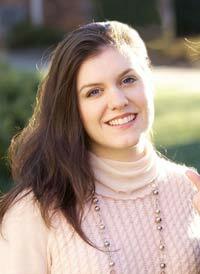 Lauren Bailey ’09 majored in journalism and English with a minor in creative writing. She lives in Charlotte and works as a reporter for The Charlotte Observer.